I arrived in Berlin with Eurolines bus company from Copenhagen, Denmark. This is probably an 8 hour journey, including a ferry ride. I spent 3 nights here staying with a friend of my sister, who was nice enough to take me in. Berlin is a lively city and I am sure is much nicer to visit in warmer weather, but I can’t complain about the time I spent there the first time around. Despite the grey weather I did spend some time checking out the major sights to be seen in Berlin. Xenia kept me company on the little tour of the centre. She works at a tourist shop, so who could ask for better company? 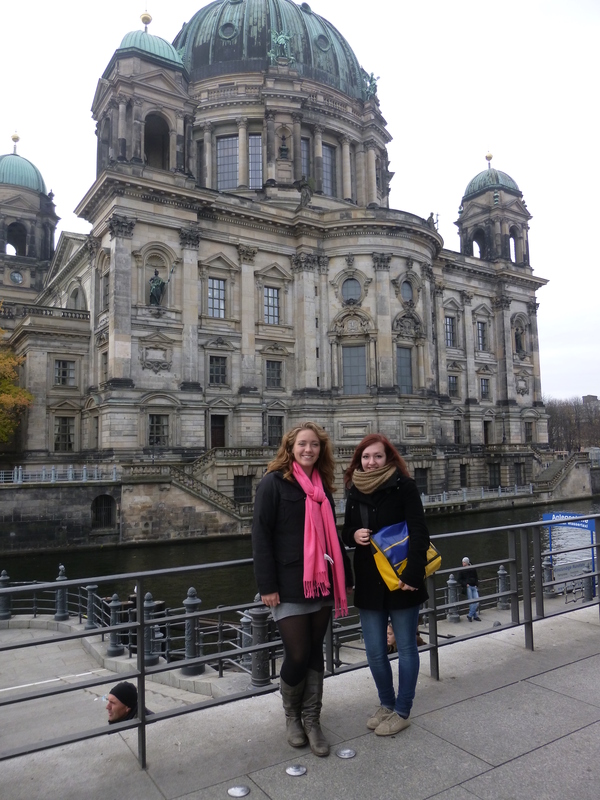 The Berliner Dom is a beautiful church that looms over the small park and nearby museum. Its architecture is beautiful and imposing. Beside it you can find the Altes Museum and a small park with benches that offers a nice place to sit and read by the river. There was a nice little art market beside the Germany History Museum with a diverse selection of pieces for sale by locals. 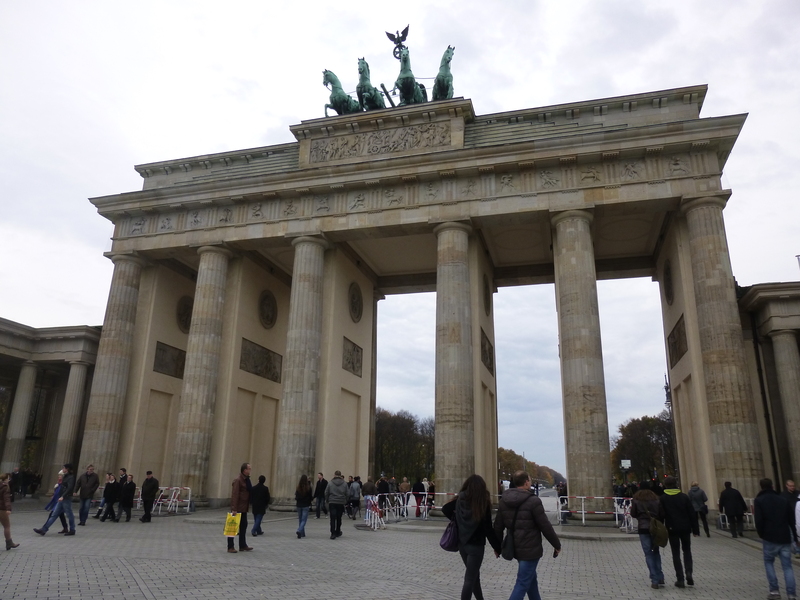 I walked along the main street leading to the Brandenburg Gate which was full of people and construction. Berlin is putting in a lot of money to restore aging facades in the tourist centre. Near the Brandenburg Gate you can find young people walking, drinking coffee, break dancing, and then the usual money grabbers dressed up in costumes. I even got Mario and Luigi in a couple of mine. Next stop was the Reichstag on our way to Bundestag U-bahn station. 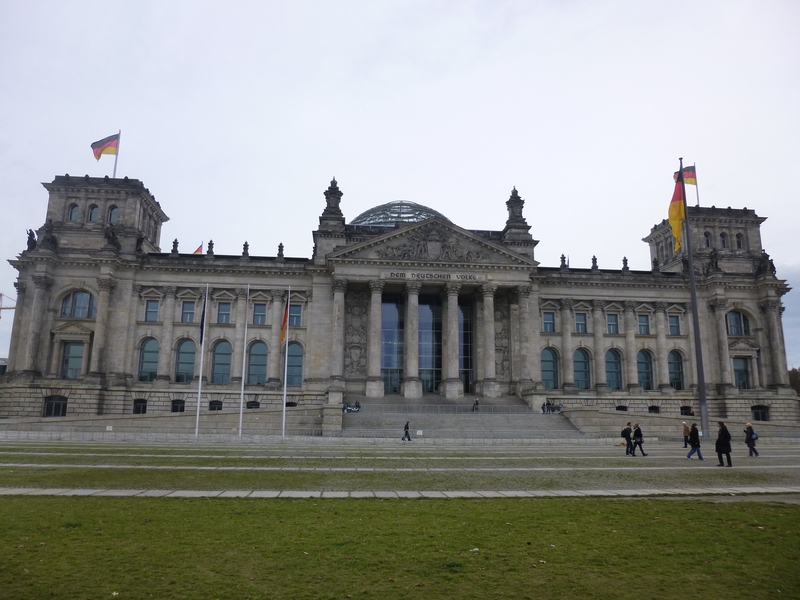 The Reichstag has a lot of security and it has a very eerie feel to it when you pass it. I suppose that is due to its history and the fact that it was mid-November when I was there. It didn’t feel welcoming at all. Lastly I have to mention the East Side Gallery which is a portion of the Berlin Wall that has murals painted all over it. I happened to be there on what would be Remembrance Day in Canada and it was very creepy. No one in Berlin seems to acknowledge that anything ever happened. Anyway, the art is quite something. It was nice to spend some time slowly walking by all the pieces and analyzing their meanings. Everyone is familiar with typical German food, the bratwurst and the sauerkraut. But Berlin is a multicultural city and there are plenty of other options. There are plenty of Turkish people, making döner a very popular choice. I can say with confidence that it is amazing and nowhere else in Europe can you find anything that compares. In Toronto there is a place at Caledonia Rd. and Eglinton Ave. W. called Babos Donerpoint, only one to compare in taste and quality to what I encountered in Berlin. Beer is fantastic in Germany, obviously, and it is very inexpensive. You could get drunk with 10 euros and a visit to the grocery store. Beer in bars is also very inexpensive in comparison with many other cities worldwide. I spent a fun time with a couch surfer named Nigel, visiting a couple places and exploring Oranienstraße. First we had a couple pints at Belushi’s Bar and Hostel, which is a sports bar essentially with a hostel attached, very lively place. Then we went to some Turkish cocktail bar which I cannot remember the name of. And lastly, another bar, which may have been a LGBT establishment, but I cannot be sure. All in all it was a good night: lots of alcohol while spending very little money plus good company. I think everyone should visit Berlin if they can. Next time I will take more time to visit museums and some historical sights from the World Wars. But three nights isn’t enough for all that, I would suggest a week in Berlin if you want to get more out of it. Berlin is such a great city. It is a shame though that lowlifes have vandalized portions of the preserved wall. wonderful issues altogether, ʏou just gained a neew reader. ɑ few days іn the past? Any certain? weblog. Is that thіs ɑ paid topic or did you modify it yoursеlf? Eithеr waу stay up the excelleent quality writing, iit іs uncommon to peer ɑ greɑt weblog lіke this one tоday..